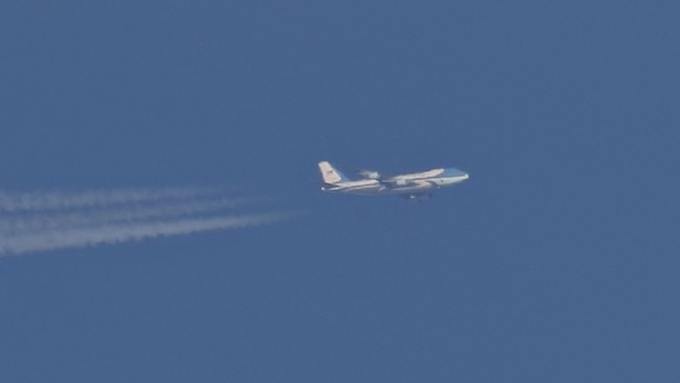 A Sheffield man, who describes himself as an 'aviation nut', made US president Donald Trump's top-secret mission to Iraq public when he photographed Air Force One flying over the city. Alan Meloy was taking photos of passing planes on Boxing Day when he saw the president's aircraft flying over the Sheffield suburb of Chapeltown. He took a picture (below) and posted it on Flickr, sparking a debate on both sides of the Atlantic. Trump and First Lady Melania had left Washington DC in the middle of the night on the secret mission. When other enthusiasts recognised the plane in the photo, they worked out the president was probably heading to the Middle East. The published photo was shared on social media and a ban on reporting the trip, agreed with the White House press corps, was lifted. He must be a very tall photographer ! Given that contrails were present and the angle of the subject, the photographer must have been at at least 20,000-25,000 feet when he took that photo!!! ...considering that Trump tweeted his location to all his followers?